Full disclosure: The research cited in this post was funded by a grant from the U.S. Social Security Administration (SSA) through the Retirement Research Consortium, which also funds this blog. The opinions and conclusions expressed do not represent the opinions or policy of SSA or any agency of the federal government. I suspect that one reason this is happening is because they have eased the eligibility requirements for food stamps over recent years – so that more people could qualify – and also made the vouchers easier to use by issuing stored value cards. At the risk of sounding cynical, this has happened largely because the food stamp program, whatever its many virtues, is at the same time yet another politically-motivated subsidy to farmers. 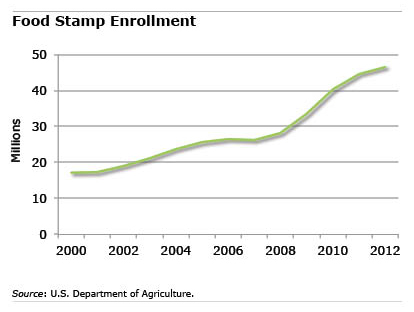 Whether the actual need for food stamps has increased can’t be determined from the increase in the number of food stamp recipients. While undoubtedly a lot of people are having a tough time in this jobless recovery, the real need for food stamps may not have increased nearly as much as the number seem to suggest. Rising employment is not enough when jobs are low wage and the cost of living continues to rise. Many employees who earn a minimum wage need food stamps so they can eat. The ways in which the food stamp program serves as a subsidy to the low wages paid by large corporate employers has been well documented by Barbara Ehrenreich, author of Nickel and Dimed, and others.